Kuttanad is a region covering the Alappuzha and Kottayam Districts, in the state of Kerala, India, well known for its vast paddy fields and geographical peculiarities. The region has the lowest altitude in India, and is one of the few places in the world where farming is carried around 1.2 to 3.0 metres (4 to 10 ft) below sea level. Kuttanadu is historically important in the ancient history of South India and is the major rice producer in the state. Farmers of Kuttinad are famous for Biosaline Farming. FAO has declared the Kuttanad Farming System as a Globally Important Agricultural Heritage Systems (GIAHS). Four of Kerala’s major rivers, the Pamba, Meenachil, Achankovil and Manimala flow into the region. 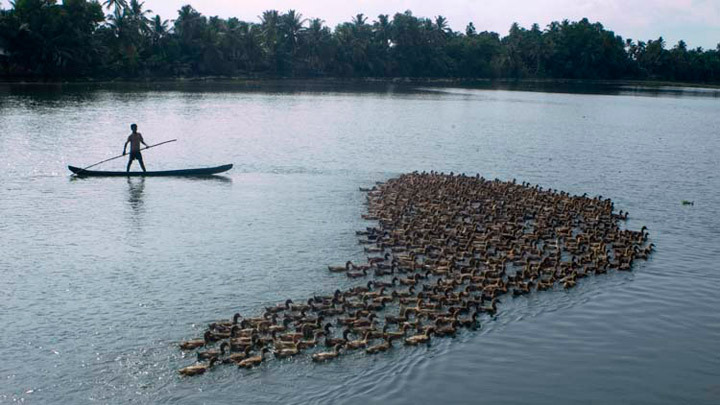 It is well known for it boat race in the Punnamada Backwaters. Also known in Malayalam as:(Vallamkalli). There is no recorded history on the origin of this land. But the oral history among local people, transferred from generation to generation is a blend of myths and legends. There is reference to Kuttanadu in the epic Mahabharata of ancient India. During their exile, the five Pandava princes are said to have travelled through this land. In those days, Kuttanadu was part of a dense forest, later destroyed by a forest fire which is also mentioned in the epic. Thus came the place name Chuttanad or the burnt place. In course of time Chuttanad became Kuttanadu. One can still see Kari or coal if we dig deep into the soil of Kuttanadu, pointing to the fact that the place was once a forest, destroyed by wild fire. In Kuttanadu most of the place names end in Kari. Some familiar place names are Ramankary, Puthukkary, Oorukkary, Mitrakkary, Mampuzhakkary, Kainakari, Chathurthiakary and Chennamkari. It is also said that Kuttanadu was once under the sea. The proof is the land is flourished with seashells. During the reign of Chera dynasty that ruled over ancient Kerala, Kuttanadu attained an important place in history. One of the powerful kings in the dynasty: Cheran Chenguttavan is said to have ruled his vast kingdom from Kuttanadu, when it was also a famous centre of Buddhism. There is another version for its place name. The Buddhist centre Buddhanad later became Kuttanad.